Yamaha Commercial Audio Systems announces the North American distribution of the Audinate Dante-MY16-AUD card. The Dante- MY16-AUD card is fully compatible with Yamaha digital MY16 card slots in consoles, processors, and digital power amplifiers. Audinate’s Dante technology provides digital media networking that meets the quality and performance requirements of professional live sound, AV sound reinforcement installations, broadcast, and recording applications. Audinate’s patent pending Dante technology distributes digital audio with imperceptible latency, sample accurate playback synchronization, and reliability. 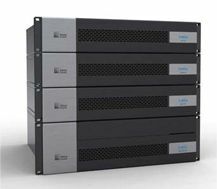 Meyer Sound’s D-Mitri digital audio platform provides the foundation of the company’s next generation of digital products, beginning with the LCS audio show control system and Constellation electroacoustic architecture. D-Mitri is a powerful network-based system that encompasses the entire audio chain, from microphone input to loudspeaker output, incorporating multichannel distribution, multichannel recording and playback, and show control automation. D-Mitri provides Gigabit networking, enhanced configuration flexibility, as well as precise mixing and routing of matrices up to 576 x 576 channels. Digigram unveils AQONDA, the latest generation of EtherSound equipment from Digigram. In essence, a remotely-controllable EtherSound stagebox, AQONDA is capable of transforming up to 16 analog audio signals into as many EtherSound channels, and injecting them into an EtherSound network. Building on the success of Digigram’s original EtherSound bridges, ES8-mic, ES8-in, and ES8- out, AQONDA combines the functionality of all these devices in a single 2U rackmount unit and incorporates additional network and control capabilities. Furthermore, the preamps may be remotely controlled from any digital console with EtherSound compatibility. Aviom introduced the Pro64 Network Manager PC control application which provides status monitoring and control of a Pro64 audio network from a central location. Individual device settings can be changed without manual front panel adjustments, adding to the simplicity and flexibility of installed Pro64 audio networks. The 6416m is a significant component of most Pro64 networks. The 6416m delivers 16 remote-controllable mic-level inputs to a Pro64 audio network. The 6416m supports all valid Pro64 sample rates, from 44.1/48kHz± to 192kHz. The RockNet 100 interface from Riedel Communications is a new digital audio network interface. It is a high-quality 3-in-1 audio interface bundled with an expansion card for Yamaha digital mixing consoles. The audio interface combines the input and output sections of three RockNet 300 devices into one 19-inch/3RU digital stage-box. With a transport capacity of up to 80 channels RockNet 100 is especially suited for smaller setups—for example as a digital multicore. The RockNet RN.141.MY expansion card for digital Yamaha mixing consoles enables full remote control over all connected RockNet modules via Cat-5. Fiberlink Matrix is a fully configurable, SMPTE compliant 32x32 optical router. The inputs/ outputs can be ordered in quantities of one and the input/output quantities do not have to match providing the ability to build a Matrix that is ideal for a specific application. Available with LC or ST connectors, Fiberlink Matrix is fully compliant with SMPTE 297- 2006, supports 3G-SDI data rates, and works with both single mode and multimode fiber. The UTAH-100 Professional Products series from Utah Scientific is a new line of small routers, distribution amplifiers, and associated products targeted at the growing market for professional-quality solutions in smaller broadcast and non-broadcast facilities. The routers are available in fixedframe sizes of 8x8 and 16x16 with 1-RU and 2-RU modular frames that support routers sized up to 16x16 and 32x32, respectively. The new series also includes a full-featured sync and test signal generator with options designed for all professional video applications. The VP-4x4K is a high-performance matrix switcher for computer graphics video signals, with resolutions ranging from VGA through UXGA and higher, and balanced stereo audio signals. The unit can route any or all inputs to any or all outputs simultaneously. Its KR-ISP advanced sync processing ensures compatibility with a wide range of computers by restoring the sync signal waveform. KR-ISP advanced sync processing can be enabled or disabled. Memory locations store multiple switches as presets to be recalled and executed when needed. Connectivity solutions provider SIIG brings to market one the largest assortments of digital connectivity hardware. Matrix units perform functions similar to splitters except they enable multiple sources to be displayed on multiple displays or projectors either simultaneously, or selectively. For example, a 4x4 HDMI Cat-5e/6 matrix can manage the digital signals from up to four sources to a maximum of four HD displays. You decide which displays carry the intended content. The Epica DGX 32 and Epica DGX 144 single strand multimode fiber matrix switchers and compatible DGX DVI and HD-15 Transmitters; and DGX DVI and HD-15 Receivers from AMX are designed to route and transmit uncompressed DVI and RGBHV video at resolutions up to 1920x1200, digital and/or analog audio and one-way control— all over a single cable at distances of 3,000 and 6,000 feet. The matrix switchers are fully customizable with fiber and/or local input and output boards. Magenta Research is introducing its full matrix, digital video switching platform. Both scalable and field upgradeable, the Infinea Opto Matryx boasts a number of signal types per input and output. These include uncompressed 1080p/60 and 1920x1200 digital video, stereo audio, bidirectional RS-232 and USB. The USB switching and extension capability on every input and output—an industry first—enables a new wave of interactive digital signage applications by supporting Human Input Devices (HID) such as keyboards, mice, and touchscreens. Distribute full 1080p HD video over long distances without signal loss. Crestron Digital- Media (DM) is a new transport technology that processes, manages and distributes all analog and digital signals, including HDMI 1.3a, DVI, HD-SDI, composite, S-video, component, VGA, simultaneous HD stereo and 7.1 surround sound audio, SPDIF, ethernet, USB control and power over Cat-5e or multimode fiber. At the heart of a Crestron DM system is one of the new DM matrix switchers. The DM-MD8x8 (shown here) is a field configurable, card-based system that accepts and processes 8 sources to 8 DM outputs or looped through as HDMI to additional DM switchers for expandability up to 40 outputs. The DM-MD8x8 manages the flow of all data, including HDCP and EDID between the switcher and DM repeaters, transmitter and room boxes. User-friendly setup and diagnostic tools are provided through the DM-MD8X8 front panel, or via DM Tools software, to make installation and system commissions quick and reliable. Atlona Technologies announces the release of its HDMI 1.3b matrix switcher, the AT-HD88MSR. This 8X8 HDMI 1.3b switch runs over Cat-5 matrix with an IR pass-through. Through low cost Cat-5/5e LAN cable, not only will high quality video and audio transmit to HD displays, but users can also switch among eight HDMI sources manually or via remote control. Atlona’s 8X8 HDMI matrix switcher’s IR function allows users to access their HD sources. Black Box VGA matrix switches are capable of independently displaying any of the eight or 16 inputs in any combination to give you eight or 16 video outputs with front panel, serial, or IP control. Designed for cross-point switching of PC VGA or HD YPbPr video, the switches output PC resolutions up to 1900x1200 and HD video up to 1080i. To switch, just send RS-232 commands or press the front-panel buttons. RGB Spectrum’s Linx CrossXFormat family of routing switchers now offers a DVI dual-link option. Dual-link accommodates signals as high as 3840x2400, with pixel clock rates up to 330MHz. CrossXFormat switchers with this option can operate in a variety of modes: pure DVI single-link, pure DVI dual-link, or single and dual-link both, or with analog RGB as well. The DVI dual-link option is available on CrossXFormat models 3300, 1700 and 900, with switching matrices from 8x8 to 32x32. The VSM-I-A-16-JR16 by Hall Research Technologies is a 16x16 or 8x8 video matrix switcher that can be controlled in three ways: manually on the front panel, through one or two serial RS-232 control ports, or remotely via IP port. This specific model supports line level audio, HD15 inputs, and RJ45 with RS- 232 outputs. Its accompanying receiver is the UV232B-R, a VGA and bi-directional RS-232 receiver. Using this configuration, up to 16 displays can be controlled or monitored with a single serial or IP connection from a control system. RapcoHorizon is featuring its new Silverflex speaker wire and jumpers. Silverflex speaker wire is made out of high stand count, silver-plated, pure copper wire offering the clearest sound in permanent audio installations and touring applications. It features individually jacketed, twisted pair wire with an aesthetic touch as well as an ultra-durable clear PVC outer jacket. Available in 10awg and 12awg, Silverflex features district coloring and use of silver plated conductors. Belden has introduced its DataTwist 3600 cables, a series of UTP copper cables that meet and exceed TIA/EIA requirements and offer significant headroom for Cat-6 installations. The new cables are designed to support Belden’s Cat-6 IBDN System 3600, which delivers high throughput and error-free performance in high-traffic and high-bit-rate applications. The DataTwist 3600 cables feature a smaller diameter and increased bandwidth to enable high-density installations. The cables provide stable transmission characteristics, plus a signal-to-noise Ratio that ensures error-free performance in LANs where noise and interference are high. The Extron CTU 300 is the single tool necessary to terminate all Extron coaxial cables and other compatible cables using Extron’s high-quality, reliable BNC crimp connectors. Extron’s exclusive precision-machined, patent-pending, self-aligning FastBite die ensures accurate, consistent crimp connections. The crimp termination performed by the CTU 300 passes stringent pull-testing for durable, long-term, secure crimps that will survive the most rigorous environments. Extron offers a full line of high-performance bulk cables for your AV needs, including high-resolution coaxial cables, audio, speaker, control, communication, and skew-free UTP cables. Gepco’s VHD2001M is an extraflexible RG6-type HD coax cable designed to meet the demands for high-definition video applications. Certified to a 4.5GHz bandwidth, VHD2001M is ideal for the transmission of uncompressed HD video in patching or remote applications. VHD2001M features a precision stranded 18AWG center conductor, a unique double-braided shield, and an extra-flexible matte PVC jacket for exceptional flexibility and flex-life. For the insulating dielectric, VHD2001M utilizes Gepco’s proprietary crush-resistant, gas-injected polyethylene compound that reduces attenuation and extends the operating bandwidth. Liberty Wire & Cable’s multi-pin connector cable serves as a key element in its family of EDULinx Classroom Solutions, which provide school districts the most efficient solutions for audio/video use in K-12 classrooms. EDULinx cables are easy to install, require no maintenance, and provide foolproof connections with mix and match components. They also combine with the wall plates from Liberty’s PanelCrafters division to deliver years of reliable, high-performance service across the entire spectrum of K-12 facilities, including classrooms, multi-use rooms, teacher lounges, student counseling centers, libraries, gymnasiums, cafeterias, and performance areas. Radial digital multi-cable assemblies feature Mogami 110 ohm AES/EBU R521 1224 RDD12M24 24 foot 12 24 cable for optimum performance and exceptional flexibility for easy installs. The XLR connectors have gold pins and black shell. Each XLR to XLR signal path transmits two channels of digital audio. Multi-channel cable assemblies accurately maintain 110-ohm impedance throughout the length of the cable. This precision is a critical factor in reducing data errors caused by reflection, which is present in cables with less accurately extruded cores. QVS has a new product line of HDMI and DVI Swivel Connector that swivel up to 90 degrees on either up or down angle. Patented swivel design eliminates bend radius and cable stress for best audio and video performance. It is perfect for wall-mount and tight installation that saves wear and tear of port. Swivel cable is available in lengths of 1, 2, 3, and 5 meters and for combination of DVI and HDMI ends. Neutrik introduces opticalCON QUAD, a four-channel version of its ruggedized-protected fiber optic connector system. Designed specifically for multichannel point-to-point cabling applications, Neutrik’s opticalCON QUAD is IP65 rated for dust tight and water jet protection. With three variations including four-channel, four-channel X-tremem and Triple-Split 12-channel assemblies, Neutrik’s new opticalCON QUAD provides several fiber solutions for any live event. Neutrik’s opticalCON QUAD is available with 4- or 12-channel mobile field cables. Its Triple-Split 12-channel cable features three optical- CON-four connectors on both ends, allowing standardized four-channel connectivity for multi-channel point-to-point cabling. Wireworks’ adaptable BG unisex XLR cords match up Wireworks’ MusiLUX microphone cable or AES/EBU digital cable with Neutrik’s convertCON connectors, ensuring the proper connection. Wireworks’ new BG unisex XLR cords can be used in both microphone and line level applications and are ideal for system designers, integrators, sound engineers, and on-the-go sound techs that require the ability to connect a variety of gear without the hassle of worrying about XLR connector gender issues. Wireworks BG cords are available in four configurations: convertCON to convertCON, convertCON to XLR3 male, convertCON to XLR3 female and convertCON to quarter-inch TRS. The new cable assemblies are offered in a variety of colors and standard lengths with custom lengths available upon request. Cable To Go’s Flexima UXGA Cables deliver high performance and flexibility. These ultra thin cables are highly flexible to make installation in even the tightest areas a breeze. The Flexima cables will not coil or snag during installation. Featuring ferrites, double-shielded twisted pairs, and triple-shielded coax, these monitor cables deliver the signal without ghosting or distortion. They are CL3 rated and constructed from premium grade double-shielded twisted pairs and triple-shielded coax. They accommodate cable runs up to 100 feet without a booster (in most cases). They are ideal for video presentation devices, home theater and HDTV applications, classroom environments, POS, server rooms, and more. Comprehensive’s HR Pro Series cables are professional grade cables that provide excellent performance and value. HR Pro Series 1.3 Category 2 HDMI to HDMI cables provide HD and beyond 1080p performance. Experience deep color, x.v. color, lip sync, 120hx refresh rate and 5.1/7.1 lossless Dolby True- HD and DTS-HD surround sound for the ultimate HD experience. HR Pro series HDMI cables provide up to 10.2 Gbps ultra high speed by utilizing a 28 gauge oxygen free copper center conductor. DVIGear has deployed a new HDMI coaxial extender based on Gennum’s ActiveConnect technology. Fully compatible with the latest HDMI v1.3 standard, DVIGear’s new DVI- 7510a coax extender supports HDMI v1.3 data rates of up to 10.2 Gbps at distances up to 100 meters with no loss of audio or video quality. Using auto-adaptive technology that automatically adjusts for varying cable lengths, this extender enables easy plug-andplay installation into any environment and provides instant support for today’s high-definition 1080p displays. Clark Wire & Cable now offers RJ-45 plugs and receptacles that can withstand the toughest environments. The RJ-45 components are able to withstand EMI, severe shock, vibration, and excessive humidity and temperatures. These RJ-45 receptacles and plugs have an insert seal that protects against contamination. With this insert seal, the RJ-45 is still protected even without the dust cover on. The RJ-45 assembly also features a cable strain relief backshell that improves cable strain relief. Tri-Net AV Cabling Structure System provides detailed connection solutions for most audio video signal distribution, as well as complete connecting hardware for each application. The system covers most of digital and analog audio/video signal transmission. Easy attach design connectors and CablesTwist on/off type connectors make installations easier in the field. Now introducing the Signa-Wave brand of high performance, American made low-loss 50 Ohm RF coaxial cables. The Signa-Wave family of low-loss coaxial cables offers superior performance and loss characteristics over higher frequency bandwidths than the traditional military type 50-ohm coaxial cables. These cables are predominantly used in land mobile radio communications, but have also evolved for use in many applications. Atlona Technologies introduces Plenum Digital Cables. Available in HDMI and DVI-D in lengths from 6 to 50 feet, these cables route digital video signals directly through plenum air spaces in accordance with the US NEC. Plenum is a compartment or chamber to which one or more air ducts connect and form part of the air distribution system. Atlona’s Plenum Digital Cables are UL CMP/CL2P approved digital cables capable of passing fire safety inspections.